Have you ever wondered if the American soldier will be remembered for their sacrifices decades from now? I believe we’ve found the answer in a small town in the Czech Republic. For almost 30 years, the city of Pilsen has been honoring the American soldiers of World War II for giving them their freedom over seven decades ago. On May 6, 1945, General George S. Patton‘s Third Army liberated the city of Pilsen from the Nazi strong hold. Sadly, Pilsen’s freedom was short-lived when in 1948 the Russians not only took control of the city, but began erasing all of the history and heroics of the American Army. In 1968, the Soviet Union and its allies had a full scale invasion with a mission to eradicate the remaining freedom of all Czech citizens. That sad chapter in Czech history all changed in 1989 when the Berlin Wall fell as did communism. Since 1990, the city of Pilsen has celebrated their freedom with an annual Liberation Festival. This year’s Liberation Festival takes place May 2-6, and you’re invited! The citizens of Pilsen are so grateful to the American soldiers that they would like to invite all U.S. Army active-duty Soldiers and their families to attend this heartwarming tribute. Those who have attended past Liberation Festivals have said it has profoundly changed their lives and how they look at the sacrifice of the American soldier past and present. What’s even more moving is how this small city continues to remember the American Soldier 74 years after America’s fighting men liberated their city. 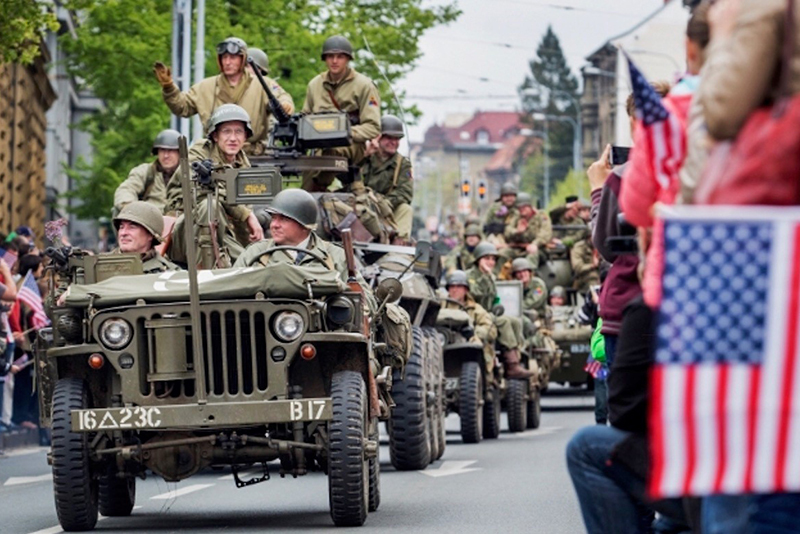 The Convoy of Liberty with hundreds of actual World War II vehicles. A discussion with World War II veterans sharing stories with students and their parents. A number of public wreath laying ceremonies at monuments and memorials honoring and remembering the American Army. Meet World War II reenactors who have re-created World War II camp sites in breathtaking details. Music for all ages. Live bands with music spanning decades. A genuine outpouring of love and appreciation for America. For all the details, visit http://slavnostisvobody.cz/en/program/main-program/. One of the special moments includes a scholarship presentation by the Brian LaViolette Foundation from Green Bay, Wisconsin. The General George S. Patton Scholarship of Honor is presented to honor General Patton and remember sacrifices of the American Soldier. It is awarded to a graduating Pilsen area high school senior who has chosen to enter the military or pursue a career in public safety or community service. In essence, a cause greater than self. Patton‘s grandson, George Patton Waters, a veteran himself, will be on hand on behalf of the Patton family along with other Americans who have traveled from the mainland to join in on this heartwarming celebration. “We hope all our Soldiers serving in Bavaria and all of Europe can join us in Pilsen and in doing so, we too can honor their service as well,” said Waters.